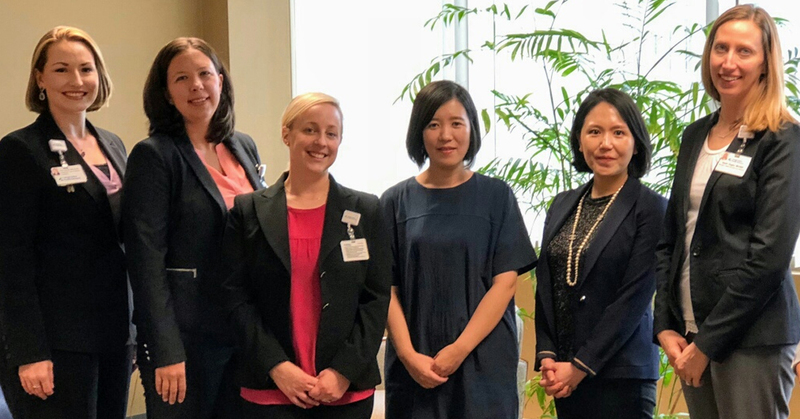 The National Commission for Health Education Credentialing, Inc. received international visitors last week at the organization’s headquarters in eastern Pennsylvania. Ms. Hyunim Bae and Ms. So-Hyun Park have traveled from the Korea Health Promotion Institute located in Seoul, South Korea, in an effort to glean knowledge and guidance as they learn more about NCHEC’s long-standing national Health Education Specialist certifications known as CHES® and MCHES®. NCHEC staff accompanied their international visitors to a meeting with BeneFIT Corporate WellnessSM, Populytics’ wellness programming arm that provides employers with individualized health coaching, health fairs and screenings, and specialty services. This visit was intended to enhance the visitors’ understanding of the function of Certified Health Education Specialists in the U.S. workforce, and to learn more about our nation’s worksite wellness career sector. The overall goal of the visit was to study NCHEC’s history and processes for creating a high-quality and marketable certification, as well as methods to augment the future of the health education and promotion profession. According to Ms. Bae, “The main concerns are to make our health education professional certification a national gold standard and to enhance the application of certification in the workplace.” NCHEC certifications are accredited both nationally and internationally through the National Commission for Certifying Agencies (NCCA) and the International Accreditation Service (IAS) under ISO 17024. Achieving both NCCA and IAS accreditation signifies NCHEC’s dedication to providing valid and reliable processes for development, implementation, maintenance, and governance of its CHES® and MCHES® certification programs. After visiting NCHEC Division Board member Nigel Thomas, MCHES®, Assistant Director of The 1199SEIU Funds, in New York, New York, Ms. Bae and Ms. Park arrived at NCHEC headquarters in Whitehall, in order to meet with NCHEC Executive Director, Linda Lysoby, MCHES® and Deputy Executive Director, Melissa Opp, MCHES®, as well as the NCHEC staff. At BeneFIT, they met with (from left) Carol Michaels, MPH, MCHES®, Adminstrator, Care Coordination; Kristin Behler, MPH, MCHES®, Director, Health Promotion and Wellness; Leah Posivak-Khouly, MPH, CHES®, Wellness Analyst; and Sarah Engler, MCHES®, Manager, Health Education and Wellness.